Since we are all physical beings with human feelings, thoughts and behavior, our emotions and DNA determine our overall health. Charkas are the spiritual powers that create a vortex of energies in the body. Chakas can become blocked from negative energy and psychic debris. This can lead to physical and emotional illnesses and uneasy feelings. Our emotions are the electricity of the body. When an emotion is out of balance for an extended period of time, the energy (or electricity) either moves through our body too quickly, too slowly, or not at all. Just imagine a sudden surge of power going through your microwave oven; eventually a fuse will blow or the microwave itself will break. The same is true of our bodies. For example, someone with a broken heart, due to the loss of a loved one, who cannot or will not work to deal with this extreme emotion, will eventually experience an energy overload which can cause diseases of the heart, lung, breasts, upper back, shoulders, arms or hands. By checking in with our emotions, we can address the “disconnect” via our mind, body and spirit. We can learn to keep our charkas balanced and healthy. Helen Chin Lui is a certified Reflexologist, certified Energy Medicine and Reiki practitioner. She is the founder and owner of the Healing Place in Medfield. She specializes in helping clients with chronic digestive disorders and chronic pain. If you like a free copy of “Proven Alternative Ways to Heal Common Chronic Digestive Problems: What Your Doctor Doesn’t Know Can Keep You From Healing,” please visit www.healingplacemedfield.com and sign up for our newsletter. As a bonus you will receive health tips, products and services. To learn more about chakra balancing or energy medicine, email us at Healing Place or call us at 508 359-6463. If you feel you are unbalanced and feel numb, we can help you. We offer free 60 minute consultation. i am having some chakras disbalanced and i want to know the solution……. As years of accumulated unsolved emotions, anger, disappointment are stored in the body, most people eventually feel unbalanced. These negative emotions upsets the delicate energy or chakra flow through out the body. How to release these emotions by becoming conscious how you feel, processing old emotions and eventually letting them go. There are many reasons why chakras become unbalanced, such as stress, anger, unconsciousness, and anything that is negative. Unless you recognized these negative emotions and thought patterns these emotions are stored in our body. As these emotions accumulate throughout our lives, most of us, eventually feel off and unbalanced, but we don’t know why. It takes a long time to become aware of our emotions and work through them before knowing how to accept them and then finally letting them go. Could these worries have anything to do with it? The headaches came soon after his doubts did. If you could offer any insight I would greatly appreciate it. I have a strong feeling that there is an energy block. What can I do to help him? Thank you for writing. To answer your questions – The right side of the body is for giving energy and the left is for receiving. Your boyfriend may be depleted, energy wise, due to how much he is giving. This may be the cause of his headaches. It also can mean that his third eye is opening. He must learn how to keep himself grounded so that he doesn’t take on too much energy. On my youtube channel, healing place medfield, I have a grounding meditation that he can do. All he has to do is listen and follow the directions. How he can be helped right now? I suggest he grounds which is very important for someone who is starting their journey. Because the journey is so exciting, people have a tendency to go overboard when they first start. There is so much information out there that it is overwhelming and exciting. It is not that he has an energy block but he is overwhelmed with the energy it is leaking out instead of recycling in his soul. Again, meditation will help him to recycle. 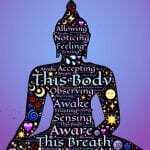 This practice will help him to bring awareness to his body. Email if you have any other questions. Chakras – How Do Chakras Affect Us?